Yeah, they've been doing those low-priced omnibus editions of the classics for a few decades now, but it seems like the market has recently exploded for this type of material due to its popularity on digital readers like Nook and Kindle (people always looking for cheap or free stuff, and a good excuse to read those things they've been meaning to for years). I remember seeing a lot of those same basic HC collections (seen in "Customers Who Bought This Also Bought" section below) over the past 30 years at B&N (although last time I saw it, the ERB Mars omnibus was just the first 3 books). But that's where B&N really shines, they've had these exclusive hardcover collections you can't get anywhere else. In the brick and mortar stores they usually have a section located directly opposite the registers with these and whatever current closeouts and remaindered discounted hardcovers and trade paperbacks they currently have stock of, and it's the section a lot of people head to immediately to check out and see what's recently available at less than cover price. It obviously occurred to B&N that they could get their own public domain classics collections printed, price them accordingly, and move a lot of them through that section, which they do. I was kind of shocked after poking around on the site to see B&N had no similar TARZAN omnibus hardcover. I wonder if it's rights-related? Maybe the reason the John Carter omnibus went from 3 to 5 is the latest two are now in public domain? 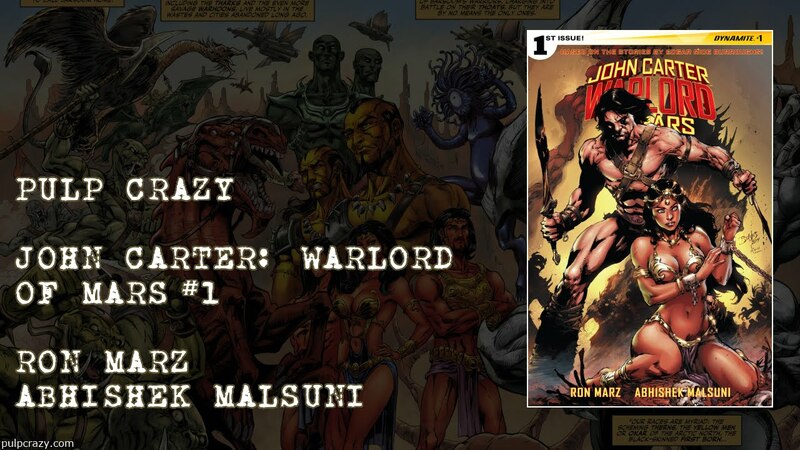 OK what do people think of John Carter Warlord of Mars #1 ? I thought the art was terrific the story showed promise, it needed to set up the series for new readers, which it did, so was a bit slow but am looking forward to issue 2. Abishek Malsuni is a real find. I just hope Dynamite can hold on to him for a while, at least. It does seem inevitable that sooner or later he's going to be scooped up by DC or Marvel. Storywise, there's not much here to comment on. it was a decent first issue. just setting things up and giving back story for those who may be unfamiliar with Barsoom and such. Is this set basically after John and Dejah have had Carthoris, or before? Good question. Unknown at this stage. Definitely liked the first issue! I like the idea of John Carter's confederate past being explored. The addition of a union commander who is using his skills to conquer the universe sounds interesting!!! I posted a variation of that idea on this site years ago--suggesting that an escaped slave from Virginia (maybe even was whipped by John Carter) finds himself on Barsoom. Obviously, over the course of the adventure, a peace would occur between the two characters. I am anxious to see where this storyline will go!